This incredible picture is a mosaic made up of 55 hi-res images taken by the MAHLI, the Mars Hand Lens Imager. That’s a camera designed to be able to take close-up shots of nearby rocks and other feature, but can also focus all the way out to infinity, allowing it to take pictures of distant geographical features as well. In the end, you’re left with a pristine (if somewhat distorted) view of the rover as if you were standing there. And there’s so much more than just the rover! The rocks and sand covering the ground, the wheel tread prints in the surface, the small plain the rover sits on. And you can see the layered hills in the distance; those rise up to become the central peak of Gale Crater, Curiosity’s home… and also the rover’s eventual destination. Remember, it’s a rover. It roves. Pictures like this also let engineers assess the rover’s status. They can look over the different parts and make sure everything’s OK, and also use it as a baseline in case something goes wrong later. It’s far more than just a pretty picture. But oh my, it’s such a pretty picture! You can get more info at Universe Today, and Emily Lakdawalla at The Planetary Society Blog points out some fun stuff to look for in the shot, too. And, I suppose, the title of this post is somewhat misleading. 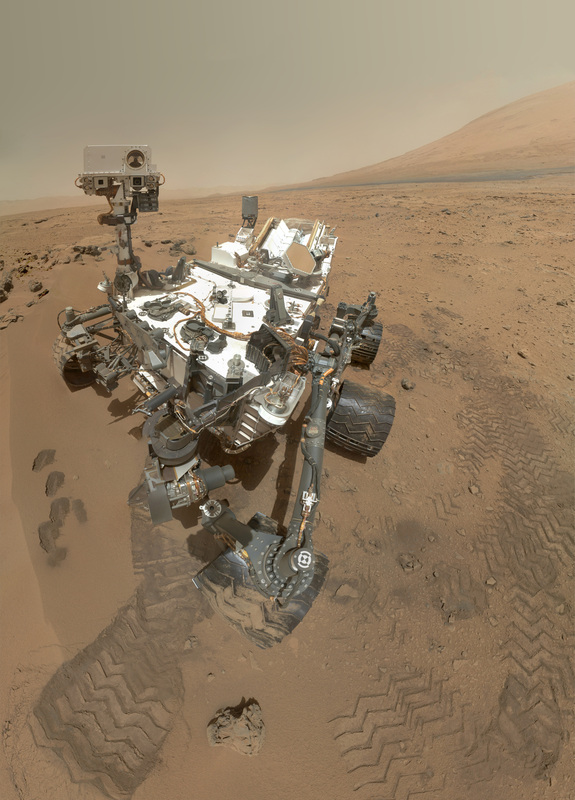 It may look like Curiosity is sitting on a sandy beach somewhere, taking its own "Wish you were here!" picture. But in reality, it’s no vacation. Curiosity is there to work. And it has just two Earth years to unravel a few billion years of Martian history. – Pew! Pew! Take *that*, Mars!